Palm Beach Dramaworks opened its production of Brian Friel's Dancing at Lughnasa on May 24, 2013. The Mundy sisters make the most of their simple existence in rural Ireland in this poignant, Tony Award-winning memory play, told from the perspective of the youngest daughter's son. J. Barry Lewis directed a cast that featured Cliff Burgess, Margery Lowe, Declan Mooney, Meghan Moroney, Gretchen Porro, Julie Rowe, Erin Joy Schmidt, and John Leonard Thompson, with choreography by Lynette Barkley. In Dancing at Lughnasa, the 1992 Tony award winner for best play, dance is a recurring metaphor, a vivid representation of how the human spirit strives to break free of crippling restraints. It’s a challenging conceit, but a successful one in this production. The talented ensemble understands and embraces these characters heart and soul. Director J. Barry Lewis obviously understands that this play requires a delicate touch. Shifts in mood are handled gracefully, helped along by Steve Shapiro’s evocative sound design and Ron Burns’ lighting. Likewise, Brian O’Keefe’s costumes are exactly right, as is Jeff Modereger’s design of the farmhouse kitchen and yard. Lynette Barkley’s choreography is also on point, from floor-busting Irish folk dances to sleeker moves that recall the grace of Astaire and Rogers. Mooney plays Michael both as a grown man and, surprisingly, as a 7-year-old — we can’t see the boy in those scenes, but the other characters can, and the effect is charming. As Chris, the marvelous Gretchen Porro simply lights up — there’s really no other phrase for it — the first time she sees Gerry, and it’s hard to take your eyes off of her thereafter. Playing the Welshman Gerry, Cliff Burgess is both engaging and wistful, offering mother and son empty promises that he somehow seems to believe will come true. Beautifully staged by J. Barry Lewis and engagingly acted by its uniformly strong cast, Dancing With Lughnasa is a character study that probes dreams and disappointments, familial loyalty and risk-taking, and the tension between proscribed behavior and a free-spirited approach to life.. The dancing in Lughnasa is choreographed by Lynette Barkley, who makes the movement reflective of each character. Moroney’s Maggie is a solid woman, but she’s light on her feet and something of a wild instigator. Burgess’ Gerry is a kind of con man Fred Astaire, slick as a former ballroom dance teacher would be, passionate as he twirls Chris, the woman he will always love and leave. Lowe’s tiny, shy Agnes becomes Ginger Rogers to Gerry’s Astaire, moving with the beautiful grace of the leading lady she’ll never be. The production elements -- Jeff Modereger’s rustic set, Brian O’Keefe’s period costumes, Ron Burns’ lovely lighting, Steve Shapiro’s artful sound design -- are just-right expressions of the world Friel summons. If you are familiar with the play, you know there is a celebrated scene in which the sisters join in an impromptu dance to a tune on the radio. In the hands of Lewis, this cast and choreographer Lynnette Barkley, it is an undiluted triumph. Once again, a cast under Lewis’ direction gives lessons in acting. In this case, class, notice how they listen intently to what is happening elsewhere in the scene even when they have no dialogue... While they all excel in this, Lowe’s face perpetually communicates the range of pain and pleasure simmering under the surface. Thompson, who has played everything from the venal Teach in American Buffalo to the preacher in Candida, deserves a special nod for his heart-breaking scenes of a once-fine now-addled mind trying to find words... Thompson makes it clear that Jack has surrendered his repressive Christian faith to the more joyous native religion – the real reason for his recall. 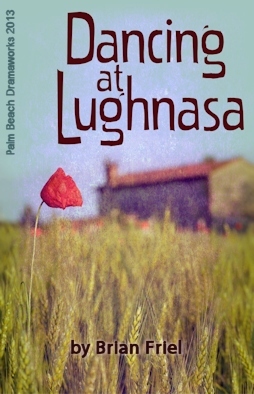 Palm Beach Dramaworks presnets Dancing at Lughnasa through June 16, 2013.